Our Holiday Gift Guide feature starts today! 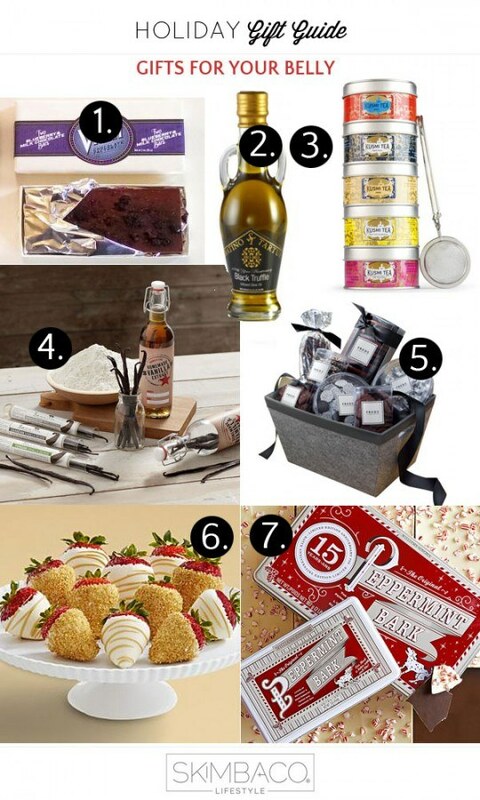 Gift ideas are picked by our entire team, and collected for you in easily read smaller bites, 7 gifts at the time. We are starting with the yummiest gifts of them all… food gifts! Order a 6 month subscription and receive four (4) chocolate bars a month, every month, for 6 months. These chocolates are from Leigh’s favorite chocolate and coffee shop in Raleigh, NC. This local NC chocolate factory is organic and sustainable, and makes a great gift for any chocolate lover. A true foodie will appreciate the gift of black truffle olive oil, and there is no worries that any foodie would have too much of this good stuff in the kitchen already. This gift set is a great collection for any tea lover. Thé du Matin is a strong, black tea morning blend. Thé Vert au Jasmin green tea perks up the afternoon and the spicy Kashmir Tchai is ideal after dinner. Both Traditional and decaffeinated Earl Grey are perfect anytime. The mesh infuser included making it easy to even give the kit for an office friend. Foodies never use the imitation vanilla sold at your local grocery store, they swear by the real deal. Even if you don’t know what to do with this vanilla infusion kit, we guarantee your foodie friend will love it. 5. Fred’s Gift Basket from Barney’s New York, $225. Set includes almond bark, toffee bites, non-pareils and chocolate covered pretzels and chips. Strawberries and champagne – you just can’t go wrong with the hand-dipped champagne strawberries! The must have Holiday candy, even Santa would approve this one.